1001 years ago, an extraordinary astronomical event occurred in the sky: the most intense supernova ever witnessed and recorded by human beings appeared in the Earth's sky in the year 1006 CE. The blast was seen from Europe to China. One of the witnesses who saw it was a young man from Cairo, Ali ibn Ridwan, then 18 years old. Later on, he produced one of the most significant records about this astronomical event. Nowadays, astronomers scrutinize his record to collect information about the 1006 supernova. 1001 years ago, an extraordinary astronomical event occurred in the sky: the most intense supernova  ever witnessed and recorded by human beings appeared in the Earth's sky in the year 1006 CE. The expanding debris cloud from the stellar explosion is still visible to modern astronomers, but the supernova looked much brighter after it blasted in the sky more than a millennium in the past. The blast was seen from Europe to China to whoever gazed in the southern night sky. One of these witnesses was a young man from Cairo, Ali ibn Ridwan, then 18 years old. Later on, he was going to produce in one of his works a most significant record about this astronomical event. Historians and astronomers turn now to his writing to collect information about the 1006 supernova. Abu 'l Hasan Ali ibn Ridwan Al-Misri (c.998-c.1067-68) was an Egyptian physician, astrologer and astronomer. He was an astronomer, physician and commentator on Greek medicine, and in particular on Galen. Some of his commentaries on Galen's works, such as the Ars Parva, were translated into Latin by Gherard of Cremona. He is also known for his supernova observation from 1006, which he mentioned in a commentary work he composed on Ptolemy's Tetrabiblos. He was later cited by European authors as Haly, or Haly Abenrudian. He is also known through the bitter and celebrated polemic he engaged against another physician, Ibn Butlan of Baghdad . Besides his commentary on Ptolemy's Tetrabiblos , to which we will turn on later in this article, we can mention among his works the Latin translation De revolutionibus nativitatum (The Revolutions of Nativities), edited by Luca Gaurico, printed in Venice (1524), and his Tractatus de cometarum significationibus per xii signa zodiaci (Treatise on the Significations of Comets in the twelve Signs of the Zodiac), printed in Nürnberg in 1563 . In 1006, the young Ali Ibn Ridwan had just begun his education in medicine, and he was also interested in astrology, a domain in which he began already casting horoscopes. The "new star," which was known later as Supernova 1006, first appeared on the evening of 17 Sha'ban 396 H/ April 30, 1006. It persisted through the summer, but by mid-August the sun had moved so close to it that, from Cairo, it was above the horizon only during the daylight hours, making further observation difficult. The historical context in which the Supernova 1006 appeared can be defined as follows. The Fatimids had captured Egypt, establishing Cairo as their capital, in 1069. The Caliph at that time was Al-Hakim. 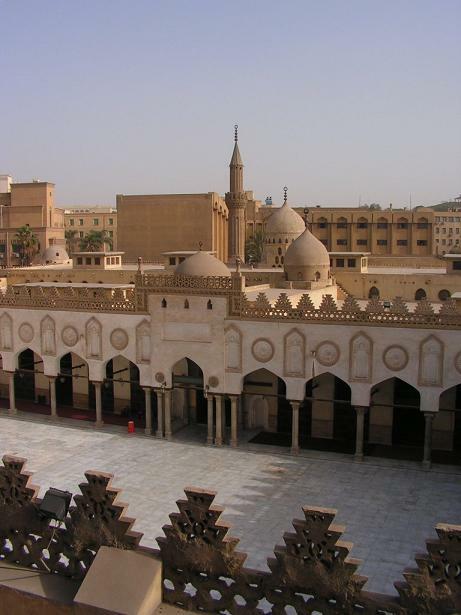 In 1105, Al-Hakim had founded the Dar al-‘Ilm in Cairo, the "House of Knowledge." This was an informal public university where anyone could go to read and copy books, study, or attend lectures in theology, grammar, philology, medicine and astronomy. Astrology was excluded, for a distinction had emerged between the empirical discipline of astronomy and what many, including Al-Hakim, regarded as its less respectable, interpretive counterpart. Figure 1: View of Al-Azhar mosque courtyard in Cairo. The mosque, founded by the Fatimid caliph Al-Hakim in 990, was under construction when the 1006 supernova appeared in the sky. (Source). In 1013 Al-Hakim would forbid the practice of astrology and later banish a number of astrologers. Instead, he patronized astronomers like Ibn Yunus, who produced a set of astronomical tables, al-Zij al-Hakimi, so accurate that they took into account the atmospheric refraction of the sun's rays at the horizon. A few years after founding the Dar al-‘Ilm, Al-Hakim began construction of an astronomical observatory. Though Ibn Ridwan makes no mention of the Dar al-‘Ilm in his autobiography, its foundation is indicative of the intense intellectual atmosphere of Cairo. As a child, Ibn Ridwan would have received his basic education at a local mosque, including reading and writing and the recitation of the Qur'an. At 15, he embarked on his medical and philosophical studies. "I had no fortune," he says, "from which I could have paid for my education and so my studies were hampered by obstacles and difficulties. Sometimes I earned my livelihood by practicing astrology, again by medical practice, and yet again by giving lessons ." The prevailing system of medical study disappointed him. Students customarily paid a substantial fee to attach themselves to a well-known teacher and memorize the works he assigned. But Ibn Ridwan says his own teacher "explained no obscure point and added no single word to whatever it was that was being read, but simply listened as the student read it." In disgust, Ibn Ridwan abandoned him. He heard of a better teacher in Iraq, but could not afford to travel there. Instead, he began to read the classical Greek medical authority Galen on his own. When he read that only those trained in geometry or logic could understand Galen's teachings, he paused to learn both. Then he returned to his close study of Galen and added Hippocrates. A physician friend finally took him on as an assistant. Ibn Ridwan gained practical experience as the physician's substitute and built up a clientele of his own. "My office," he says, "was medicine and astronomy." In his personal library, he kept a copy of the Tetrabiblos, an astrological work by the 2nd-century Greek astronomer and mathematician Ptolemy, which includes a chapter on the roles various planets might play in causing diseases and injuries. Ibn Ridwan later wrote an extensive commentary on the Tetrabiblos. Like Ptolemy, he believed astrology could be useful for understanding the past and predicting future conditions, but he considered it an imprecise art compared with the mathematical and geometrical calculations of astronomy. In one of his medical treatises, Ibn Ridwan expressed scorn for a colleague who insisted on consulting the stars before considering a patient's illness. Not until the age of thirty did Ibn Ridwan feel sufficiently established in his profession and secure enough financially to marry and buy a house. He continued his studies another year until, he wrote: "I achieved a reputation in medicine." He was appointed, probably around this time, to be chief physician to Caliph Al-Hakim. However, on February 13, 1021, Al-Hakim died, in obscure conditions. For the next two years, his elder sister Sitt al-Mulk ruled as regent for Al-Hakim's young son. When she too died, 17-year-old Al-Zahir became caliph for the next 13 years. Those turbulent times must have troubled Ibn Ridwan. Professionally, though, he prospered. He invested in real estate so he could look forward to a comfortable retirement. He took on medical students of his own, and his reputation spread as far as Makran, in Baluchistan, whose ruler consulted him after being partly paralyzed . Figure 2: Remnants of SN 1006. Today, the supernova SN1006 is only a faint, spherical shell of gas that continues to expand at a high speed in space. This photo shows part of the shell passing through trace amounts of interstellar matter. The remnants are a million-degree hot plasma and still emit radiation at nearly all wavelengths. By the time of his death, probably in 1067 or 1068, Ibn Ridwan had written more than 100 works, mostly commentaries on Galen and Hippocrates or medical treatises, several of which he dedicated to his Jewish friend and colleague Yahuda ibn Sa‘ada. He also wrote on philosophy, theology, natural science, astronomy and astrology. It is in one section of his commentary on Ptolemy's Tetrabiblos that we find a passage devoted to the unique heavenly spectacle he had witnessed in his youth on May 1, 1006: the blast that revealed the birth of the new star —SN1006. Because the zodiacal sign Scorpio is a bad omen for the Islamic religion, they bitterly fought each other in great wars and many of their great countries were destroyed. Also many incidents happened to the king of the two holy cities [Mecca and Medina]. Drought, increase of prices and famine occurred, and countless thousands died by the sword as well as from famine and pestilence. At the time when the spectacle appeared, calamity and destruction occurred which lasted for many years afterwards ." He then detailed the positions of the sun, moon and other planets, down to their degrees and minutes in each sector of the zodiac when the star first appeared. These precise records of planetary positions in Ibn Ridhwan's account helped modern astronomers to fix the date of SN 1006 and locate its position in the sky. He noted in particular that the "spectacle" did not move independently of the stars and that it disappeared "at once" when the sun came within sixty degrees of longitude of its position. That corresponds to a visibility period of about three months. From Ali bin Ridwan's observing site in Cairo, the star was above the horizon only during the day when it disappeared. Since Venus at its brightest can be seen during the day, his statement suggests that the star had become fainter than this . Figure 3: Comparative data on the brightness of SN 1006. (Source). A millennium later, we know that what Ibn Ridwan witnessed was a supernova, the cataclysmic explosion that marks the death of a star. However, the new star was not seen only in Egypt. Benedictine monks in Switzerland wrote of the supernova, "in a wonderful manner this was sometimes contracted, sometimes diffused, and moreover sometimes extinguished." According to Chinese astronomical records, the supernova was east of the constellation of Lupus, south of Di, and one degree west of Centaurus. They claimed also that its brightness equalled half the intensity of the full moon . Other Arabic accounts of SN 1006 exist. In the Chronicles of Ibn al-Athir (13th century), he said that in the year 396 H (1006 CE), "at the new moon,…a star similar to Venus appeared on the left side of qibla… Its rays on the Earth were like the rays on the Moon ." Bar Hebraeus: "In A.H. 396 (1006 AD) there appeared a star resembling Aphrodite in brightness…gave out light like the Moon…and remained 4 months and disappeared ." Among European accounts, one of the most famous is that of Hepidannus of St. Gall in Switzerland, who wrote that the star was visible in the extreme south. This places a limit on how far south it must have been since it must have been above the horizon from St. Gall (latitude 47 ½ degrees north). Chinese and Japanese accounts place the new star on the present day border of the Constellations Lupus and Centaurus, thus its position can be tied down to fine limits. The duration of time the supernova was visible from several accounts was 4 months before being lost in the Sun's glare. After 7 months the supernova again became visible in the dawn sky between November 24 and December 22 1107. Then again ancient accounts say it was visible for at least a year. It is possible that the star was erratically visible for up to 10 years according to the Chinese Chronicle Sung Shih, referring to a star visible in November 1006 through May 1016. Astronomers believe from the ancient accounts that this was the brighter, more luminous Type 1a supernova with an estimated maximum apparent magnitude similar to the light of a half Moon shrunk to the size of a star. The supernova remained visible in varying degrees of intensity throughout the summer, before disappearing in the fall. As the Earth rotated, it became visible again in December, and appeared on and off for at least the next year and a half. Figure 4: Cover of The Historical Supernovae by David H. Clark and F. Richard Stephenson (New edition, Oxford University Press, 2002). 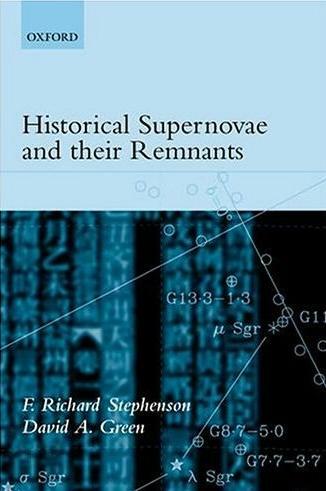 This book reviews both the historical observations of supernovae (SN) seen in our Galaxy over the last two millennia and recorded in East Asia (China, Japan and Korea), Europe and the Islamic world, together with modern observations of the remnants of these supernovae. In the 20th century, astronomers were aware of the ancient records on SN 1006. Some of them began then investigating these accounts in order to define the degree of brightness of this Supernova and locate its remnants in the sky. Among those astronomers, the work of Frank Winkler was the most conclusive. As a young faculty member in the 1970's, Middlebury College  astrophysicist Frank Winkler had the opportunity to study satellite data on x-ray emissions from space, and he wanted to see if he and his students could use this and other data to locate the remains of SN1006. A team of English and Australian astrophysicists used Ibn Ridwan's data in 1977 to narrow down the area of sky in which the supernova could have occurred. While the Swiss record established the northern limit of the supernova's visibility, only Ibn Ridwan, Winkler explains, gave its position "along the ecliptic, that is, the path that the planets follow through the sky." Winkler and his students combed through the x-ray data looking for an emission source in the right area. And they were definitely able to detect it. It was the beginning of Winkler's long fascination with SN1006. Winkler's current work focuses on its distance from Earth, its brightness and the material the exploding star ejected into space. He's still learning about the composition of the remnant, but in 2003 he was able to obtain a more precise estimate of its distance from Earth than had previously been possible by comparing a series of digital images taken in the 1980's and 1990's. His estimate that it is just over 7000 light-years from Earth is widely accepted. How bright was SN1006? Once again, Ibn Ridwan helped provide the answer. His account was the only one to compare the supernova's brightness with that of both Venus and the moon. "Since we know how bright Venus gets," Winkler says, "and we know the brightness of the full moon, we can use those as benchmarks along with Ibn Ridwan's description to peg the intermediate spot in between them that leads us to an estimate for how bright the 1006 supernova would have been, at its peak." Figure 5: Significance map of the signal from the Supernova Remnant 1006. The intensity of non-thermal X-rays (ASCA data) is shown by the contour. (Source). Astronomers measure brightness—or "magnitude"—along a logarithmic scale in which the brighter stars have lower numbers. Using their knowledge of SN1006 and its distance from Earth, Winkler and his team calculated its maximum brightness at a magnitude of -7.5. This squares neatly with Ibn Ridwan's estimate and makes it the brightest supernova in recorded history. "That's about a hundred times brighter than Jupiter ever gets," Winkler says, or "250 times brighter than Sirius," the brightest star in the sky. Furthermore, it would have twinkled strongly because of the angle at which it appeared through the atmosphere. In Cairo, it never rose higher than about 23 degrees over the horizon—hold your hand at arm's length with fingers spread and the tip of your thumb on the horizon, and that's about where the tip of your little finger will be. "It would have been twinkling like crazy," Winkler says . 1054 Taurus 21 months Crab Nebula Venus Chinese, Japanese, Arabic, Native American? 1670 Cassiopeia ? Cas A SNR Undetectable ? Figure 6: Table recapitulating historical supernovae blasts from the past. (Source). Allel, Chama, "L'enseignement medical au Caire au moyen âge à travers un traité médical arabe d'Ibn Ridwan". Online here. Burnham, R., Burnham's Celestial Handbook, New York, Dover Publications, 1978, p. 1117. Clark, David H., Stephenson F. Richard, The Historical Supernovae. New edition, Oxford: Oxford University Press, 2002. Donsbach, Margaret, "The Scholar's Supernova", in Saudi Aramco World, July/August 2006, pp. 38-43. Online here. Ibn-Ridwan. Medieval Islamic Medicine: Ibn-Ridwan's Treatise "On the Prevention of Bodily Ills in Egypt." Translated with introduction by Michael W. Dols. Arabic text by Adil S. Gamal. Berkeley, CA. : University of California Press, 1984. Long, K., Blair, W.P., 1988, "An Improved Proper Motion Measurement of SN 1006, Astrophysical Journal, vol. 333, p. 749. "Monday, April 30, 2007: The Heavenly Messenger of 1006. 1001 years ago tonight...". Online here. Murdin, Paul and Lesley, "Supernovae", Cambridge University Press 1985, p. 14. Van den Bergh, S., 1976, The Optical Remnant of the Lupus Supernova of 1006, Astrophysical Journal Letters, vol. 208, L17. Rius, Mónica, "Sobre la supernova del 1006", in Al-Qantara: Revista de estudios árabes (Granada-Madrid), vol. 21 (2000), Fasc. 1, pp. 225-226. Rius, Mónica, "Eclipses y cometas en el Rawd al-qirtas", in Al-Qantara, vol. 19 (1998), No. 1, pp. 3-17. The Mysterious Supernova of 1006 AD: online here. Winkler, P. F., Long, K., 1997, X-Ray and Optical Imagery of the SN 1006 Remnant, Astrophysical Journal, vol. 491, p. 829. Winkler, P.F., and Kamal, M, "How Bright was the 1006 C.E. Supernova? A Re-examination from 11th-Century Sources." The American Astronomical Society 201st Meeting, January, 2003, Session 1, HAD I: Special Topics in the History of Astronomy. Abstract online here. On what is a supernova, see link. Ibn Butlan was a Christian Baghdadi who left his native city in 1048, travelled to Syria and Egypt, and finally settled in Antioch where he died ca. 1063. He spent three years in Cairo (1049-52) and during that time there developed between him and his great rival Ibn Ridhwan a strong hostility that showed in their controversy: see J. Schacht and M. Meyerhof, The Medico-Philosophical Controversy between Ibn Butlan of Baghdad and Ibn Ridwan of Cairo, Cairo: Egyptian University, 1937. The pseudo-Ptolemaic Centiloquy and its commentary, which is sometimes attributed to Ibn Ridhwan, is actually the work of Ahmad ibn Yusuf ibn al-Daya: See Liber quadripartiti Ptolemei id e[st] quattuor tractatuu[m]… (Venice: Per Erhardum Ratdolt de Augusta, die 15 mensis Ianuarij 1484). This work includes the commentary on Ptolemy's Centiloquium, spuriously attributed to "Haly" [i.e. 'Ali ibn Ridwan]. In his bio-bibliographical work Tabaqat al-attiba' (the classes of physicians), Ibn Abi Usaybi'a devotes a long entry to Ibn Ridhwan's life and works: see the electronic version of this dictionary here. Margaret Donsbach, "The Scholar's Supernova, in Saudi Aramco World, July/August 2006, pp. 38-43. Online here. Ibidem, and Ibn Abi Usaybi'a, Tabaqat al-attiba' (the classes of physicians), entry "Ali Ibn Ridhwan", online here. In Sharh Ibn Ridhwan 'ala tarbi' Batlimyus (Ibn Ridhwan's commentary on Ptolemy's Tetrabiblos), quoted in Margaret Donsbach, "The Scholar's Supernova", in ibidem. See also Jennifer Ann Seymore, The Life of Ibn Ridwan and his commentary of Ptolemy's Tetrabiblos, PhD Dissertation, Columbia University, 2001. This dissertation situates the commentary of Ibn Ridwan on Ptolemy's Tetrabiblos within the history of Islamic science and the commentary genre. In a special appendix, the author provides translations of key portions of the commentary, as well as indexes of scholars and works mentioned in it. See for a new interpretation of Ibn Ridhwan's account, P.F. Winkler and M. Kamal, "How Bright was the 1006 C.E. Supernova? A Re-examination from 11th-Century Sources", The American Astronomical Society 201st Meeting (January, 2003, Session 1, HAD I: Special Topics in the History of Astronomy). In this talk, the two authors claim take ground upon Ibn Ridhwan's record to estimate quantitatively the brightness of SN~1006 are few. They conclude that they found an excellent agreement with a recent a posteriori estimate of peak visual magnitude V0 = -7.5 ± 0.4\ based on a new measurement of the distance to the SN~1006 remnant and the absolute magnitudes for typical Type Ia supernovae": link. "Monday, April 30, 2007: The Heavenly Messenger of 1006. 1001 years ago tonight..." Online here. "The Mysterious Supernova of 1006 AD", online here. Ibid. "Disappeared" means that the star vanished into the Sun's glare. Middlebury College is a small, private liberal arts college located in the rural town of Middlebury Vermont, United States. Margaret Donsbach, "The Scholar's Supernova, in Saudi Aramco World, op. cit; and P.F. Winkler and M. Kamal, "How Bright was the 1006 C.E. Supernova? A Re-examination from 11th-Century Sources", op. cit. See "The Mysterious Supernova of 1006 AD" (op. cit.) for information on the investigations of other modern astronomers and astrophysicians on the physical characteristics of SN 1006.